The dancer makes her way on stage. Clad in a brown and blue patterned dress, she looks nothing like the stereotype as she glides silently to the center of the floor and stops. One arm raised in the air she is a stone statue of intensity, unflinching and tortured, the tone of her upcoming dance communicated clearly and stoically in her face. 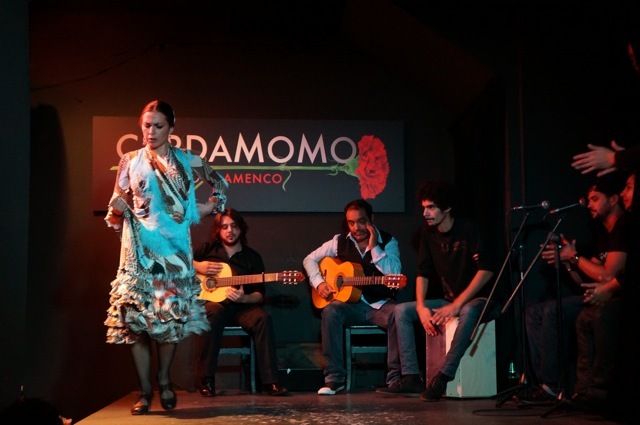 Four men sit behind her, playing guitars, a drum and singing, staring up at her with longing and desire, not for her body but for her dance to begin. The music plays on. Guitars and drums matched by a lone man’s Spanish cries. And then her movement begins. Though her hands and body remain slow and graceful, her feet are on fire, rapidly stomping and tapping with rhythmic intensity. As she moves I can feel all the heartbreak and sadness life has ever brought her. The torn intensity on her face remains unchanged since when she first came into view. Yet in her footwork there is anger, clarity in truth. I get the feeling that if she danced like this on the front porch of an ex-boyfriend he would understand everything he did wrong and what a great loss he will suffer with more clarity than any letter, any words could communicate. 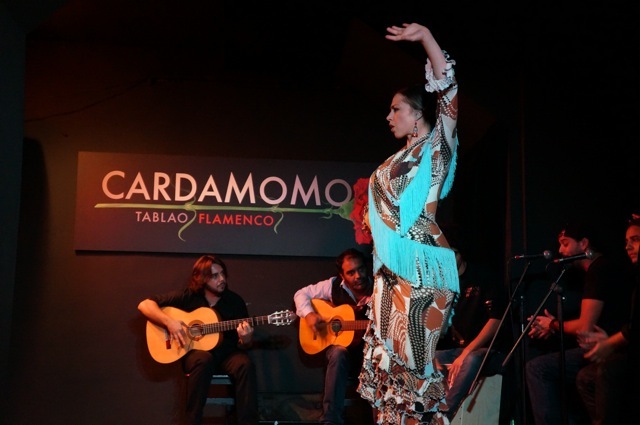 While Flamenco may seem like a Spanish tourist cliché, Cardamomo Tablao Flamenco offers the most authentic Flamenco in Madrid, offering tourists not their invented image, but a statement on what this gypsy dance means and is today. 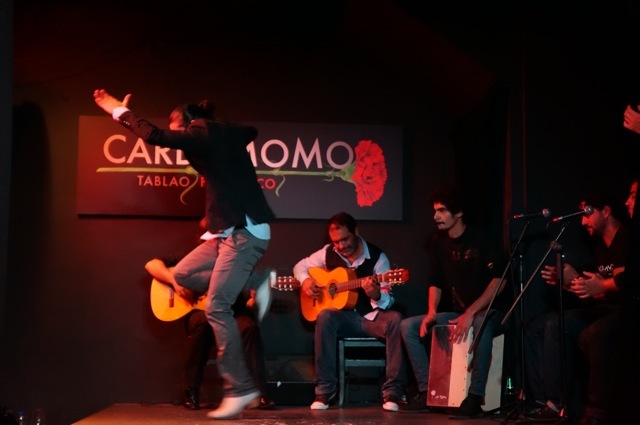 So much more than dancing, this Spanish folk art is an intricate mixture of guitar playing, singing, and of course, heart-pounding dance moves. 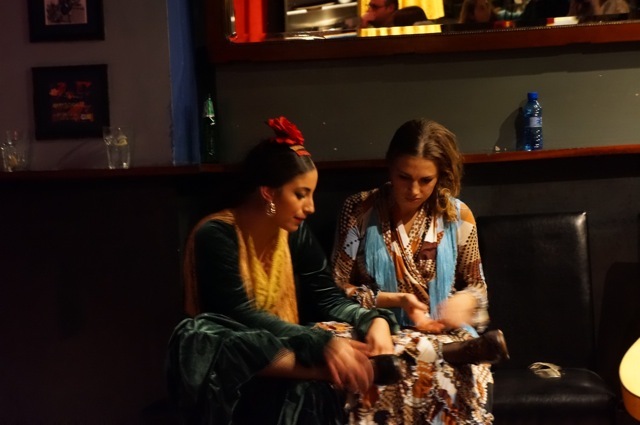 While the Andalucia region is more known for Flamenco than Madrid, many of the art’s greatest perform here to make a raw statement about the future of their gypsy craft. Show admission includes a drink. Or turn, the evening into dinner and a dance and purchase a ticket that includes both. For budget travelers, entry to the bar with limited views of the stage is free.